Parents who formerly worried about “empty nest syndrome” might today worry more that their children will never leave home. In countries around the world, increasing numbers of young people – particularly males – are having difficulty navigating the transition from adolescence to adult self-sufficiency. They remain isolated, avoidant, jobless or underemployed, and a-motivational – often staying in their childhood home into their 30s. The causes are numerous: economics, internet connectivity, changes in parenting, features of the educational system, and more. Yet the issue is infrequently studied, perhaps because it does not fit neatly into a diagnostic category. Despite this, clinicians are increasingly seeing these individuals – or their parents – in therapy. 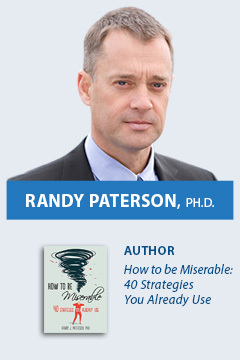 At Change ways Clinic in Vancouver, Dr Randy Paterson has been working with failure-to-launch cases for over 20 years. In this one day workshop, he reviews the nature of the problem, the factors that seem to contribute, and a wide variety of interventions drawn from cognitive therapy, behavioural activation approaches, and attachment theory. Whether you work with these young people directly, or see the parents struggling with a too-long-occupied nest, this program will provide you with perspectives and techniques to help. Learn to identify this non-diagnostic clinic population, and to distinguish normal dependency from an interruption in development. Develop an awareness of the multiple factors likely to be operating in any given case. Know strategies for siding with the client and increasing motivation. Understand when to hold back and when to push progress. Develop an array of intervention strategies that can be tailored to the individual. Learn how to incorporate family in the therapy – even when the goal is independence. Increase awareness of how and why families inadvertently sabotage progress. Randy Paterson, Ph.D, R.Psych. is a psychologist and the founding director of Changeways Clinic, a private psychotherapy service in Vancouver BC. He is the author of How to be Miserable: 40 Strategies You Already Use, The Assertiveness Workbook, Your Depression Map, and Private Practice Made Simple. He is the lead author of Canada’s most widely used group treatment program for depression, co-author of the online Antidepressant Skills Workbook, and creator of multiple manuals and resource guides for clinicians. In addition to his clinical work, Dr Paterson provides educational training programs for mental health professionals across Canada, internationally, and online on topics including diversity awareness, communication skills, positive psychology, and treatment strategies for mood and anxiety disorders. Recently his clinical work has focused on the issues of emerging adulthood and the establishment of independence. His forthcoming book is How to be Miserable in Your Twenties: 40 Ways to Evade Adulthood.